One day the mining boom in outback Australia will come to an end. Happily, it will leave behind infrastructure to make aviation safer. A key fact for aviation planning is that a woman’s haircut and rinse costs $160 in the Pilbara region of Western Australia. The hefty price is because the stylists, like most other workers in the region, fly in and fly out once a fortnight. Almost everything, and almost everyone, in this part of the word relies on aviation. This is the downside of a fly-in fly-out (FIFO) employment model. Towns built from scratch by mining companies-such as Leigh Creek South in South Australia, and Newman in WA, with all the normal, everyday-priced amenities and facilities-are a thing of the past, unjustifiable in terms of overall cost. Besides bulky pay packets in the pockets of mining personnel, there are however many positives about FIFO, not the least of which is a vast improvement in facilities at regional airports to service hugely increased air traffic. Outback skies aren’t quite the isolated areas they used to be. 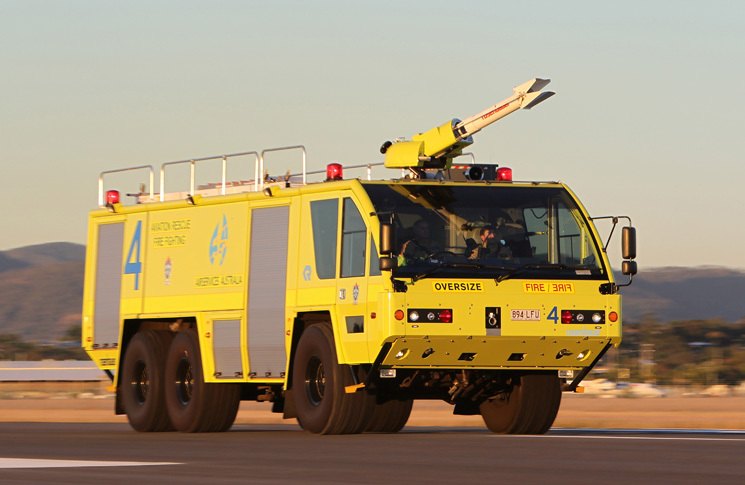 Things began to ramp up back in 2009, when Airservices reintroduced an operational aviation rescue and fire fighting (ARFF) service at Karratha, then the busiest regional airport in WA. Monitoring all regularly scheduled passenger aircraft arrivals and departures seven days a week, the on-duty fire crew staffs a Fire Control Centre and three Rosenbauer MK 8 ULFVs (ultra-large fire vehicles); Austrian-assembled state-of-the-art tenders over 10 metres long, weighing in at 30 tonnes, but still capable of a top speed of 120km/h thanks to a 14.0 litre Detroit Diesel engine pushing out 495kW of power and 2576Nm of torque, allowing response to incidents within two minutes. Fully equipped with fire-fighting agent, these behemoths can empty their 9000-litre water and foam-filled tanks in less than two minutes via a roof-mounted monitor capable of throwing the contents a distance of more than 80 metres. As ARFF General Manager Andrew Rushbrook said at the time: ‘Airservices has made a major commitment to investment in new equipment, training and recruitment to ensure we can deliver outstanding services to this community and others where airports are experiencing significant and sustained growth’. 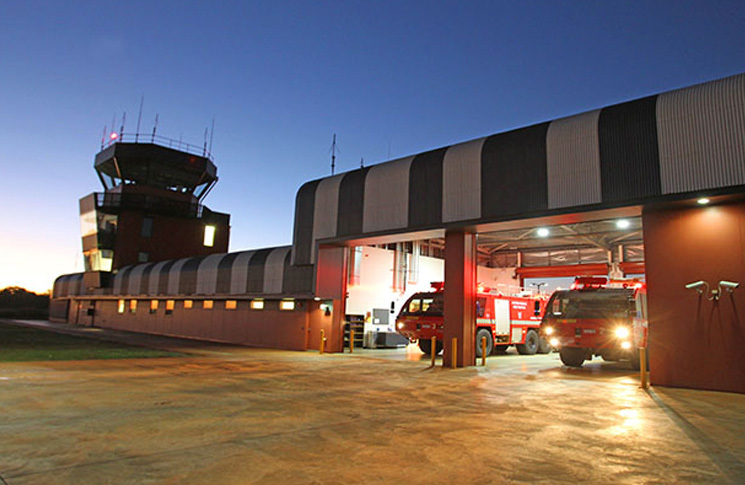 Providing regular domestic services, connections to overseas destinations, and as an equally important base for extensive mining and tourism operations in WA, Broome airport also received a significant upgrade with the opening of a new $20 million combined air traffic control tower and aviation rescue fire station, some 18 months ago. Standing over 16 metres high, the air traffic control tower is kitted out with the latest air traffic surveillance and communications technology including touch screens at the controller’s consoles- no more paper flight progress strips! With eight huge windows of 40mm thick glass, each weighing 600kg, the new tower is the first that Airservices has opened in 15 years (though a further $942 million will be invested all over Australia in similar infrastructure over the next five years), and features two vehicle bays and a maintenance bay, home to another three mighty Rosenbauer Mk 8s. Taking 14 months to design, and built by local contractors supported by specialists from Sydney, Melbourne, Brisbane and Perth, the facility is steel-framed, covered by Colorbond steel and compressed fibre-cement sheeting, and is designed to withstand Category 4 cyclones. It also collects rainwater for landscape irrigation. There is also a new Airservices radar installation at Paraburdoo, in the Pilbara. It provides air traffic controllers with the ability to ‘see’ aircraft down to the ground at Paraburdoo, as well as giving coverage down to approximately 10,000 feet for aircraft operating out of the West Angelas iron ore mine 110km NW of Newman in the Hamersley Range; Barimunya, the airport for BHP-Billiton’s Yandi iron ore operation 90km NW of Newman, and Fortescue Dave Forrest aerodrome, access for Fortescue Metals Cloudbreak Mine, 89km WSW of Nullagine, in the Chichester Range. It can also provide coverage down to 15,000 feet for traffic to Newman. Airservices’ Executive General Manager Projects and Engineering, Mark Rodwell, said that air traffic in Western Australia had grown exponentially in the last five years. ‘For example, Perth Airport has experienced a rise of 12.5 per cent in the last year alone. With so many additional planes flying to and from the Pilbara region, radar provides us with the capability to determine the exact location of an aircraft in real time, enabling us to make safer and more efficient use of airspace, allowing aircraft to operate more efficiently, and reducing pilot and controller workload to further enhance safety.’ Perth itself has received significant upgrades to its ILS (instrument landing system) with the replacement of localiser antenna arrays at the end of each main runway (Runway 03/21). Increased air traffic volumes have also been the rationale behind Airservices’ decision to give Port Hedland airport a complete makeover, with an aerodrome flight information service (AFIS) and ARFF (the latter previously withdrawn in 2003 following a steady decline in passenger numbers as the resource sector experienced a downturn). Again, the ARFF will use Rosenbauer Mk 8s, in an interim fire station until the new one is completed in 2014. The AFIS is now providing aircraft with directed traffic information, emergency services alerts and local weather advice. 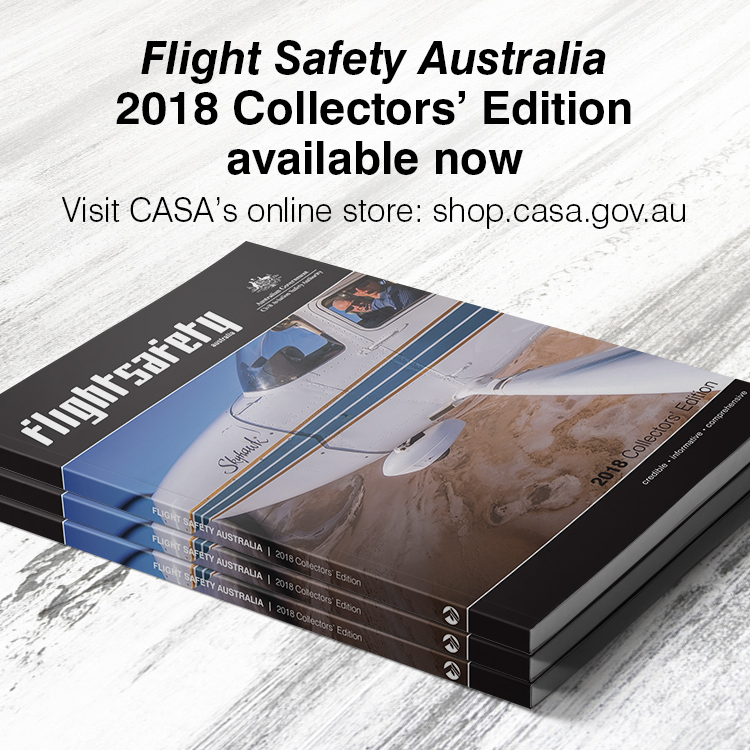 But Western Australia is not the only state to receive the benefits of Airservices’ safety plans. In March last year, a brand new air traffic control tower was officially opened at Rockhampton Airport. Once again, it is fitted with the latest air traffic surveillance and communications technology, integrating flight and operational data, surveillance and voice communications into one tower-specific design. Standing some 25 metres tall, the new tower is significantly higher than the 50-year-old one it replaced, giving controllers much better visibility of all operational areas of the airport. A precast concrete structure, the tower is designed to withstand cyclones, flooding and earthquakes. Its 1.3 metre thick slab is reinforced with 10 tonnes of reinforcing steel and 140 cubic metres of solid concrete. Despite being 50mm thick and weighing several tonnes, the windows are particularly special; manufactured to stringent optical, thermal and acoustic performance criteria to ensure there are no distortions or imperfections to interfere with a controller’s view. Gladstone is next on the list for a new tower.